Quest Of Kings Video Slot Review - Casino Answers! Quest of Kings is a 5-reel, 25-line video slot developed by Cryptologic, featuring a wild symbol, scatter wins, a special feature and a bonus game. You can play the Quest of Kings video slot at [Americans: Unfortunately due to legal restrictions you are unable to play at any of the online casinos this game is at. We recommend you trying playing the unique slots at Win A Day Casino instead.]. Quest of Kings is a penny slot. Bets on the Quest of Kings slot machine are $0.01, $0.02, $0.03, $0.04, $0.05, $0.10, $0.15, $0.20, $0.25, $0.50, $0.75 and every denomination of $1 up to $20. You can select up to 25 paylines per spin. The minimum total bet on the Quest of Kings online slot is a penny per spin and the maximum is $500 per spin. Quest of Kings has a great betting range that will suit most any casino player. To play the Quest of Kings casino game, select your bet and hit the “Spin” button. The “Bet Max” button will spin the reels with all 25 paylines selected. The top-paying symbol on the Quest of Kings video slot is the Princess symbol. 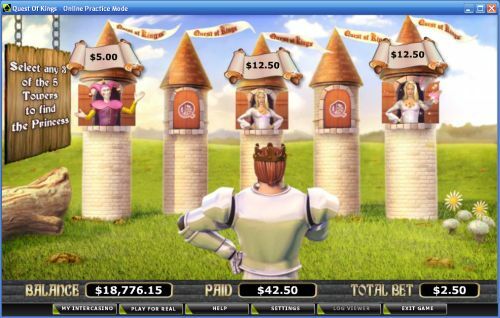 5 Princess symbols in a row on an active payline will payout Quest of Kings’ 8000 coin top jackpot. The Princess symbol is wild and will substitute for all symbols except for the Knight and Rose symbols. The next highest paying symbol is the Crown, which can pay out up to 1000 coins. Quest of Kings has a Knight special feature When the Knight symbol appears on reels 2, 3 and 4 at the same time, it will pay out any prizes and turn into a Princess wild symbol. Additional payouts will then be made. The Knight special feature prizes are multiplied by the bet per line. Knight special feature wins are added to payline and scatter wins. The Knight symbol only appears on reels 2, 3 and 4. 3 wild symbols in the middle of the reels will certainly lead to some huge winnings when you play Quest of Kings at [Americans: Unfortunately due to legal restrictions you are unable to play at any of the online casinos this game is at. We recommend you trying playing the unique slots at Win A Day Casino instead.]! The Quest of Kings slot machine’s scatter symbol is the Rose. You can get a scatter win of double your total bet by hitting 2 Scattered Roses all the way up to 100X your total bet for hitting 5. When 3 or more Scattered Roses appear on the reels of Quest of Kings, you will trigger the Quest of Kings bonus game. Choose 3 of the 5 Towers to search for the Princess in. If you find her, a random prize will be awarded. If not, you will be given a consolation prize. All prizes are multiplied by the triggering bet. Bonus round prizes are added to payline and scatter wins. As you can see by the screenshot provided below, the Quest of Kings bonus game is animated and looks great. Payouts are displayed on the Paytable. Payline wins are multiplied by the bet per line. Highest win amount is paid on each selected payline. Scatter wins are multiplied by the total bet and added to payline wins. Feature wins are added to scatter and payline wins. Win combinations pay from left to right only, except for the Scattered Rose. The Princess will substitute for all symbols except for the Knight and Scattered Rose symbols. Quest of Kings has a simple autoplay mode. You can select from 1-99 autoplay spins by using the “+” and “-” buttons. To start the autospin mode, press the “Spin” or “Bet Max” buttons. You can stop the autoplay mode on the Quest of Kings online slot at any time by pressing the “Stop” button. Quest of Kings has a good top payout, a different special feature from most (in place of free spins) and a bonus game that you can play and win from. You can play the Quest of Kings video slot when you sign up and make a deposit at [Americans: Unfortunately due to legal restrictions you are unable to play at any of the online casinos this game is at. We recommend you trying playing the unique slots at Win A Day Casino instead.]. Where can USA players play the Quest of Kings slot game for real money? Unfortunately, players located in the United States of America cannot play the Quest of Kings video slot for real money at this time. For a USA-friendly slot machine you can play, please read our Mystic Dragon Video Slot Review. Can I play a Quest of Kings free flash game in my browser? You can play the Quest of Kings online slot machine for real money only. To play Quest of Kings in your browser, visit [Americans: Unfortunately due to legal restrictions you are unable to play at any of the online casinos this game is at. We recommend you trying playing the unique slots at Win A Day Casino instead.]. If you have any issues with the flash casino, make sure you have the newest version of Adobe Flash Player.